Western blot analysis of extracts from various cell lines using Ambra1 Antibody. 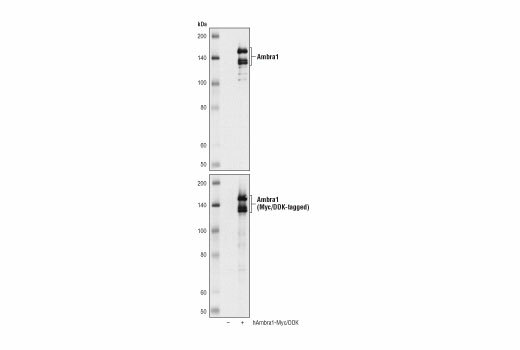 Western blot analysis of extracts from 293T cells, mock transfected (-) or transfected (+) with a construct expressing Myc/DDK-tagged full-length human Ambra1 (hAmbra1-Myc/DDK) using Ambra1 Antibody (upper) or Myc-Tag (71D10) Rabbit mAb #2278 (lower). 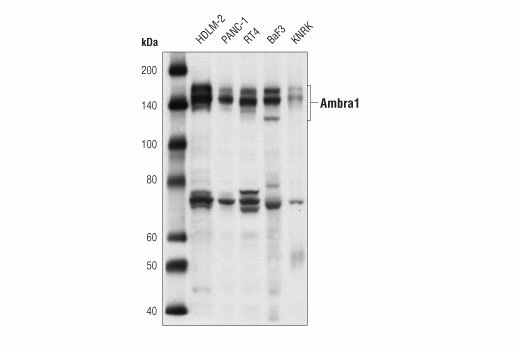 Ambra1 Antibody recognizes endogenous levels of total Ambra1 protein. A band of unknown origin is observed at 75 kDa in some cell lines. Polyclonal antibodies are produced by immunizing animals with a synthetic peptide corresponding to residues surrounding Leu220 of human Ambra1 protein. Antibodies are purified by protein A and peptide affinity chromatography. Activating molecule in Beclin1-regulated autophagy (Ambra1) is a WD40-containing protein expressed during neurodevelopment that is required for neural tube development and autophagy (1). Several studies have identified interactions between Ambra1 with regulators of autophagy and apoptosis (reviewed in 2). Ambra1 was originally found to interact with Beclin-1, a key protein responsible for activating the class III PI3K Vps34 (1). Further studies showed that Ambra1 tethers the Beclin-1-Vps34 complex to the cytoskeletal network through dynein light chains and that during autophagy ULK1 phosphorylates Ambra1, resulting in disassociation with dynein and translocation of the Beclin-Vps34 complex to the endoplasmic reticulum to initiate autophagosome formation (3,4). In addition, it has been found that Ambra1 binds to mitochondrial Bcl-2 and that this interaction is regulated by either apoptosis or autophagy (5,6). Ambra1 also interacts with Parkin, an E3 ubiquitin ligase important for mitophagy, a selective autophagic process of mitochondrial clearance (7,8). Fimia, G.M. et al. (2007) Nature 447, 1121-5. Fimia, G.M. et al. (2013) Oncogene 32, 3311-8. Di Bartolomeo, S. et al. (2010) J Cell Biol 191, 155-68. Fimia, G.M. et al. (2011) Autophagy 7, 115-7. Strappazzon, F. et al. (2011) EMBO J 30, 1195-208. Tooze, S.A. and Codogno, P. (2011) EMBO J 30, 1185-6. Van Humbeeck, C. et al. (2011) J Neurosci 31, 10249-61. Van Humbeeck, C. et al. (2011) Autophagy 7, 1555-6.